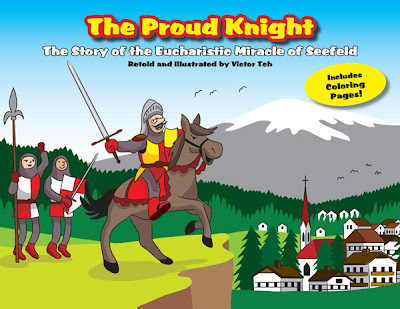 “The Proud Knight”, nnow available as PDF eBook, is a humorous retelling of the Eucharistic Miracle of Seefeld, Austria. Oswald Milser was a victorious but arrogant knight. During Holy Mass, he decided that he deserved the best and forced the priest to give him the largest Eucharistic Host. God decided to show him that Jesus was greater! Includes coloring pages!